Make It in One takes the fuss out of getting dinner on the table. The 140 recipes in this versatile collection are all designed to be made in a single vessel—from a skillet, Dutch oven, or sheet pan to a slow cooker, Instant Pot, or multi-cooker. Readers will find everything from comforting classics like Beef Stroganoff and “Roast” Herbed Chicken (made in an Instant Pot) to imaginative new recipes like Pho-Style Pot Roast Dinner and Sausage Jalapeno Popper Dinner—all simple to make and easy to clean up after. 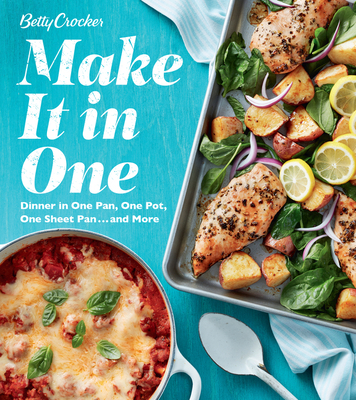 With an introduction on how to best use pressure cookers and slow cookers, genius tips on how to customize or extend recipes, and Quick-Prep and Done-in-30-Minutes-or-Less icons, Make It in One makes dinnertime a snap to make. Features include fun dinner solutions, including Oven-Frying, Make It Meatless, and Clever, No-Fuss Pizza Crusts.